Chapter Fifteen: "Contrary to the Plan"
Adapts "The Arrival of Skull Greymon"
Adapts "The Crest of Sincerity," "The Piximon Cometh" and a teency bit of "The Prisoner of the Pyramid"
Life ain't easy for the DigiDestined - they are in the middle of being chased across the desert by Kokatorimon's cruise ship, and attempt to hide in a cactus patch, only for it to turn out to be a mirage. Kokatorimon isn't so lucky the next time, though, as another giant cactus turns out to be real, catapulting his ship off into the sky. The flower atop the cactus then blooms, revealing Mimi's Crest. Shortly thereafter, when a Kuwagamon attacks them, Tai is a paralysed with fear at the prospect of letting Agumon Digivolve again, and the kids are instead saved by Piximon, the famous Digimon trainer, who takes them back to his hidden mountain home. While the other kids are forced to "train" cleaning his home, Piximon sets Tai and Agumon out on a different quest, to find themselves - Tai sees an image of himself as a young kid, learning and failing to ride a bike, and realises that to keep trying and never give up is true courage. Meanwhile, Izzy and Matt have ventured outside Piximon's protective barrier, following the signals of their Crests, and although they obtain them, they alert Etemon to their location. He dispatches Tyrannomon to destroy them, but Tai and Greymon arrive and make short work of him. Piximon tells the kids the meanings of their Crests, and they leave to continue their fight against Etemon. Chapter Seventeen: "What Price Success?" Adapts "The Prisoner of the Pyramid" and "The Earthquake of Metal Greymon"
Meanwhile, in the pyramid, Tai's team have discovered the sender of the SOS - Datamon, another victim of Etemon's, who offers them Sora's Crest in return for setting him free. They do so, only to discover that Datamon's just as bad as Etemon, as he seizes Sora. But then, Etemon, having fought his way through the kids' Digimon outside, enters the room, and smashes his way through Kabuterimon and Greymon before striking Datamon down, sending him plummeting into the coils of the Dark Network. Sora snatches her Crest and the kids flee, as Datamon drags Etemon into the network with him, but the result is an unexpected one - Etemon and the network merge, making him more powerful than ever. Finally, Tai's Crest actives, and Greymon becomes MetalGreymon, turning his power on Etemon. He is destroyed, but the explosion rips open a wormhole that sends Tai and Koromon... back to Earth. Chapter Eighteen: "There And Back Again"
Adapts "Home Away From Home," "Forget About It!" "Weregarurumon's Diner," "Princess Karaoke" and "No Questions, Please"
Chapter Nineteen: "Love and War"
Adapts "Sora's Crest of Love" and "The Gateway to Home"
The kids penetrate Myotismon's castle, but they are too late to stop him from leading his army through the gate, on their mission to conquer Earth... and the destroy the Eighth Child! 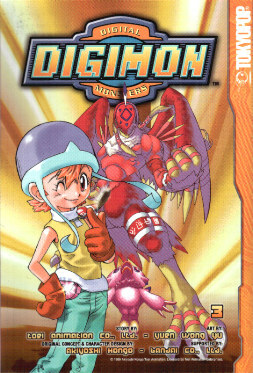 Chapter Twenty: "It's All In The Cards"
Adapts "It's All In The Cards" and "Return to Highton View Terrace"
Chapter Twenty-One: "Izzy's Fingers of Fury"
Adapts "Return to Highton View Terrace" and "The Eighth Digivice"
Birdramon becomes Garudamon, and the battle escalates, bringing to the surface memories that the kids had repressed - memories of a battle between a Greymon and a Parrotmon that had taken place at Highton View Terrace four years before, which they had all seen. As Garudamon dispatches the Mammothmon, the kids realise that this past battle is the common link between all of them, and hence, the Eighth Child will have seen it too. This volume is truly where the large compressions and omissions begin to come into play. The Champion Digimon to not battle SkullGreymon. The events of "The Crest of Sincerity" are mostly omitted, except for the final scenes of Kokatorimon's pursuit of the kids. Izzy and Matt do not climb down the well to find their Crests - instead, they are apparently in the well's bucket. Piximon is the one who tells the kids the meanings of their Crests, rather than Sora, after learning them from DemiDevimon. "The Prisoner of the Pyramid" and "The Earthquake of Metal Greymon" are combined into a shorter story - rather than abscond with Sora and Biyomon after his release, Datamon is defeated there and then. Consequently, Datamon's plan to copy Sora is omitted, as is the kids leaving the pyramid, then re-entering it later when they realise he's still in there. The events of "Forget About It!" "Weregarurumon's Diner," "Princess Karaoke" and "No Questions, Please" are all told in recaps only, compressed into four pages. Also, while the anime placed "Princess Karaoke" after "No Questions, Please," the recaps summarise it before that episode. In the anime, Flymon attacked the other kids, and was destroyed by Birdramon, while in the manga, he attacks Sora, and is destroyed by Greymon. Also, in the anime, more time passes between this and Myotismon's arrival, as the kids are asleep when DemiDevimon makes his move, injuring Biyomon, which in the manga occurs at the same time as Flymon's attack. Sora's story about her family life and it's relevance to her current situation is omitted. The events of "The Gateway to Home" are all but omitted, leaving only the kids' final attack as they try to stop Myotismon from entering the gate. Presumably, though, as with the events of "The Crest of Sincerity" and those events omitted from Volume Two, they did still occur in the manga's continuity, and we simply didn't see them. The events of "Almost Home Free" are completely omitted. Rather than finding the eighth Digivice in the magpie's nest, Wizardmon stops the bird in flight and takes it from it. The manga does not normally suffer from errors, but in this volume, it makes a few notable gaffes. One of the characters claims that Joe's Crest teleports them out of the cage, when in reality, the transformation of the floor of the cage into the Crest causes them to fall into a passageway containing a tunnel that leads them out. Kokatorimon's name is misspelled as "Cockatrimon," though it's worth noting that this is exactly how everyone in the anime's dub *pronounced* the name. Highton View Terrace is misspelled as "Heighton" View Terrace - it's a mistake I used to make myself, actually. Throughout this volume and the rest of the manga, Garudamon's name is misspelled as "Garudomon." The image of Wizardmon on page 151 is a direct copy from his model sheet.